Enjoy an account without any maintenance fee. In order to use it you only need to install imaginBank app on your smartphone. Request one free debit card. In addition, you can request a duplicate in bracelet or sticker format so that your pace does not stop. Withdraw cash freefrom more than 9,400 Caixabank ATM's in Spain and if you travel to Europe find out here where you can withdraw cash free. A free imagin debit card. 1. How do I sign up for an imagin account with no charges if am not with Caixabank? It will only take a few minutes! When you join imaginBank we will give you an account and a card, with no charges. 2. Can I open more than one imagin account? imaginBank is characterised by its simplicity, so only one account per user is allowed. Why? Why have more than one account if you can have everything under control with just one? 3. Can I register another account holder? No. The imagin account only permits one account holder. 4. How do I access my imaginBank account? At imaginBank we want to make things easy for you, so you can check all the information about your account via the mobile phone app. We have designed an initial summary screen that will allow you to keep up to date at all times and access the most important things quickly and easily. You can access your account both from the "¡Hola!" screen and from the main menu in the “Mi dinero” section. Impossible to get lost with online banking! If you do not have your mobile to hand, you can make some consultations from the Facebook app or from an ATM, but to access all functionalities you will need the mobile app. 5. How do I make transfers within Spain? 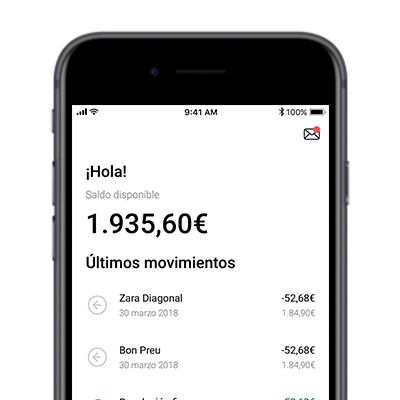 To make a transfer to any account in Spain, you can go to the “imaginPay” option on the main menu and the “Enviar dinero” option. Once you are in “Enviar dinero”, if you have the recipient's account number (CCC or IBAN) you should choose the “Su cuenta” option. At the same time as you make the transfer you can keep that person as a contact and you will never have to key in their account number again! All contacts which are kept will be stored in your imaginBank address book where you will be able to see them or enter new ones.